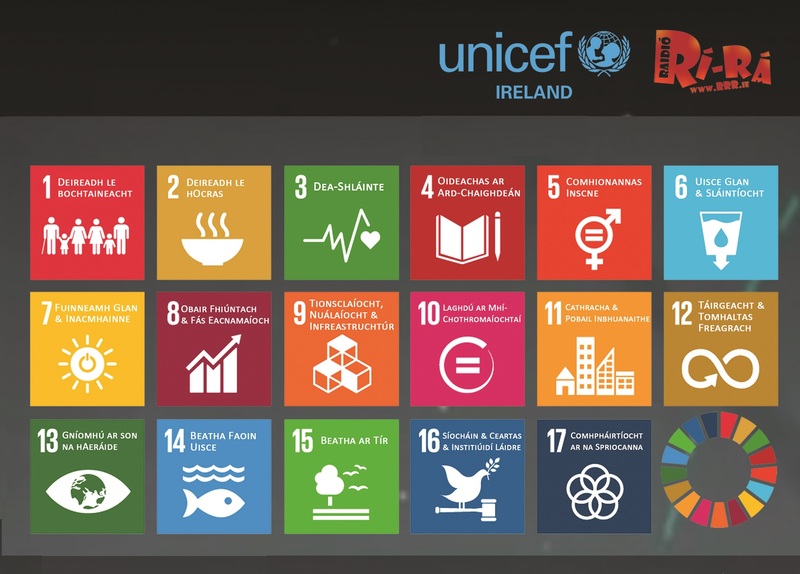 Tá na Spriocanna Domhanda Um Fhorbairt Inbhuanaithe (Global Goals for Sustainable Development) fógraithe ag na Náisiúin Aontaithe. Tá 17 sprioc (goals) ann agus an aidhm (aim) atá acu ná an domhan a chosaint ó athrú aeráide (climate change) agus é a dhéanamh níos sábháilte, níos cothroime agus níos córa do gach aon duine. Bíodh is nach bhfuil sa domhan seo ach mar a bheadh gráinín beag amuigh sa spás (a speck in outer space), feictear dúinn go bhfuil sé millteach mór (massive!) agus muid inár seasamh air. D’fhéadfadh cuma mhillteach mhór a bheith ar na Spriocanna Domhanda sin. D’fhéadfá cabhrú ar thrí bhealach. Is féidir leat rud éigin a cheapadh (invent), a bheith nuálach (innovative) agus dul i mbun feachtais (campaign). Tá ceannairí domhanda tiomanta (dedicated) na spriocanna a bhaint amach agus tá súil againn go mbeidh sibh páirteach chomh maith. Tá físeáin thacaíochta ar fáil in go leor teangacha agus tá an-áthas orainn go bhfuil siad ar fáil as Gaeilge.